Two Featherboards Are Better Than One TV Tonight: What About Bases? From time to time, readers ask us interesting questions that we like to share. In this case reader Becky has got her hands on an old drill press — which is cool in and of itself — but this one’s got the name “Thor” written on it, which always makes something more interesting. Becky took the time to send us a few snapshots and some observations. 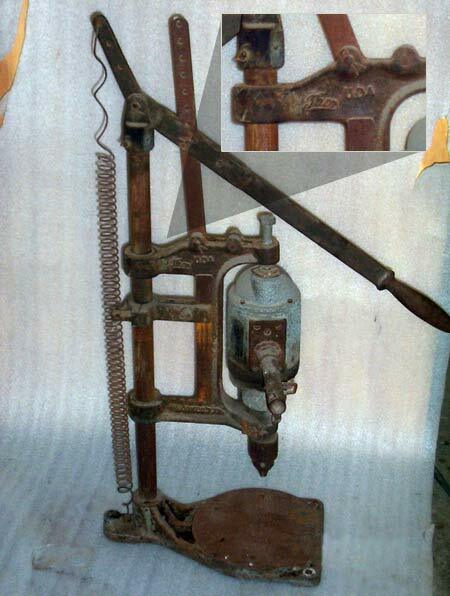 This drill stand looks to be made by the Independent Pneumatic Company, the manufacturer’s plate lists Chicago. The plate also reads “Thor No. DSUD, mod.# 759,ser.# 208803”. The plate is on the inside of the top of the cap. On the bottom cross brace it reads “Ind. pneu. tool.” This is hard to see from the pictures. The top cross brace reads “Thor” and “UDA”. Thor is written in script. I have also taken some measurements: the post is 1-1/4″ OD and 30″ tall, press lever is 23-7/8″ from end to center point of connecting joint, bottom plate is 9″ OD and 1-1/4″ thick. The drill attached to it is another quest. It is an old Black and Decker 1/2 horse, type BB, 110 volt, 4 amp, 475 RPM and serial # 29391. I found out from an engineer at Chicago Pneumatic that “Ind. Pneu Tool” is out of business and that there was Thor Power Tool Co. up until the 1980’s. This drill stand was my grandfather’s and handed down to us when my father passed away in Feb.
On a personal note, I’d love to see if it fires up and still works, but that’s beside the point. What we’re looking for here is a bit more info on this bruiser — if anyone has the low-down on “Thor” or can help fill out what Becky’s actually got here, please let us know in comments. I grew up in a home that had a Thor “Auto Magic”, a 40’s era semi-automatic washing machine. Fill, wash, spin & drain functions are manually controlled. You can see one in operation here: http://tinyurl.com/5u93hm An optional dish rack was available! I believe Thor is still in business having merged with ATP. I found this reference and from the looks of the logo, it is the same. Link is no good. Thor is no more. They haven’t manufactured any hand tools since 1964 as far as I can determine. With its sweet looking turbine-like flame shooting out about 14 inches….this thing screams danger but it sure knows how to heat a garage enough to make it the only one on the block without snow on the roof in the dead of winter. I think you are the only person that still has a manual. I’ve looked everywhere for one. Would you be willing to copy it for me? Or scan it and post it? I love this little Jet Engine! I actually have a Thor brand drill that was my Grandfathers and it still works last I checked. It only has a forward gear, no reverse. When my grandfather was alive he told me that they used it in a drill press years ago. I was online trying to find out how much it was worth when I read this article. I have a Speedway drill (115 volt, 3 amp.) that’s 50 + years old – manufactured by Thor – in LaGrange Park, Illinois. I’m interested in history of the Speedway line and Thor. Anyone able to point me in the right direction? Please, can you send me history and comments from U14k electric drill? I have a drill of this serie and i wand know its dates. My name is Abdon in Texas and I too have a Thor Drill Press, but mine is heavier than the one pictured. The drill ia a much larger Thor with only forward turn. The plate on it says rpm of what looks like 19. the pattent # 165240. Wish to find how old it is, and what it is worth. I have a thor drill model 10. It reminds me of my fathers drill and the amazing spark show, just as I remember when I was a kid. I have just inherited a THOR worm drive saw, basically a classic “Skillsaw” 77 on steroids! it weighs about 3 times that of a regular 7 1/4″ and the blade appears to be at least 10″. It is a magnificent beast of a thing and is in pretty good condition protected as it was by it’s all steel case which I’m assuming is original although I can find no markings on the case. Everything about this thing is extremely HD and it looks as if it would cut 4 x stock all day, although I’m not sure you’d find anyone capable of handling this thing for any amount of time. I’ll clean it up a little and take a picture if anyone is interested. I found a site called Eurtonelectric.com that claims to repair and rewind motors etc for Thor power tools. I have an old 1/2 inch drill that will snap your wrists if you don’t hold on tight when drilling in wood. Heck of a tool. I have a thor 7 1/4 worm drive from 1947 and it is in perfect order. I am a union carpenter, local 509 in Cleveland, and this saw is as good as any saw made today. I had to put in a grounded chord to make it legal as it is not double insulated but other than that is the saw I use when installing wood floors for the Cavaliers and local basketball courts for schools all around Northwest Ohio.It still has original instructions and case. I bought it for 13 dollars at a garage sale hoping it worked and at 63 years old it is a gem. Martin, isn’t Cleveland in NorthEAST Ohio? I have 2 Thor worm drive saws I’ve aquiried over the years. Don’t have the service manuals for the tools and would be interested in getting a copy. Martin, if you see this, let me know if you are willing to shar a copy of yours. I have 2 Thor wormdrive circular saws . My Grandfather and I used them both during or careers as carpenters . One is a 6″ model #5981 with original case in very good condition from 1947 . The other is a 8″ model #3A with case which we used alot but isn’t in such good shape , runs but is weak . Does anyone one know the value of theses saws ? I just bought a Thor model JS 21 “all purpose electric hand saw” and I need to find out more about it. What made it “all purpose?” It looks like a jig saw on steroids, and has a 5 1/2 inch by 6 inch foot. I have a 1942 photo here of my mother at work at Independent Pneumatic Tool Co., which became Thor Tool Co. I was trying to find out what city it was in (I think Chicago, but can’t verify that online – she lived in the suburbs so it would have been far), and if they worked on the war effort. She is seated at a table with 8 women on lunch break. Does anyone know that history? The town was Cicero, Illinois. look for Speedway Blue Power tools and you will find it on the net. They later moved to the town where I grew up, LaGrange Park, IL. Check this site for more info. Independent Pneumatic and later Thor were located in Aurora, Illinois. I have a Thor elec generator model #8397 and need some info about it. Can you help? but would like wiring diagram confirmation. I have a Thor saw model #4-A. Does anyone know where I can find any information on this saw. I doing searches and this is one of the first places to come up. I have an Half inch drill made by The Independent Pneu Co. Chicago. It works well.Model no. is 781. Patents from 1913 to 3/17/25. I assume that it would be made in 1925 or 1926. I live in Melbourne Australia. The drill has been owned by 2 people., my uncle and me. I enjoyed the comments of other people with similar tools. This business was founded in 1893, as the Independent Pneumatic Tool Co., by John D. Hurley, John Hopkins (then the mayor of Chicago), and Roger Sullivan (a politician). The following year Hurley’s brother, Neil C. Hurley, Sr., was appointed to the board to directors. Early products included a pneumatic riveting hammer, bicycles, and motorcycles. A separate company owned by members of the Hurley family, Hurley Machine Co., produced a washing machine that also used the Thor name and logo.In 1953 the Independent Pneumatic Co. name was dropped in favor of Thor Power Tool Co. The same Thor logo remained in use. Speedway Manufacturing Co. was acquired in 1954 and incorporated its name and brands into the Thor family.Thor was best known for their handheld power tools, which are outside the scope of this website. They qualify for listing here because they made at least one stationary machine, namely a bench grinder that was sold through Montgomery Ward Co. At least some such grinders bore the Speedway label; Speedway Manufacturing Co. of Cicero, IL and La Grange Park, IL. Speedway Mfg Co was a division of Thor Power Tools.In August 1964, Stewart-Warner Corp. announced that they were acquiring Thor Power Tool Corp. and merging the two businesses, Shortly afterwards, Stewart-Warner claimed that Thor had overstated its assets and understated its liabilities, and the purchase agreement was rescinded. Stewart-Warner continued an advisory relationship with Thor, and in December of 1964 a Stewart-Warner employee assumed the presidency of Thor Power Tool Co. Over the next few years, Stewart-Warner continued to purchase more shares in Thor, and it appears that the “Thor Power Tool Co.” was supplanted by “Stewart-Warner Corp.” by 1988; by that time they were no longer selling bench grinders or handheld power tools. If I remember right, Thor also had a plant on Kane street in Aurora Ill. I inherited a Thor B66S bench grinder. Still operates smoothly, cord needs replacing before safe to use, though I’ve used it a handful of times already. I would love to get my hands on some history of it or an operators manual. It is a model 5683 with 1/4hp. Haven’t torn it open to see the condition of the motor, but starts quickly and smoothly. Any info would be much appreciated as I inherited it from my grandfather and he from his father in the 70’s. I have a Thor Model # 13. The trigger is broke. Does any one know where I can find a replacement? I am having the cord replaced on my Thor drill. The repair place (who is reputable) said you just can’t get parts anymore so if it needed brushes or something you’re not going to find parts. I have a power wrench that we used in the 1940’s that is original and in good working condition. Its markings are Thor Universal Drill Model 1953, Independent Pneumatic Tool Co. Chicago. I would like to sell it to some one who would appreciate it. Does anyone know what it is worth? I’m like so many others that have sent posts on the thor,sore situation. I have spent countless hours trying to locate schematic drawings for several Thor tools that I have oem parts for. About 4 years ago, there was a local plant closing that went into business at or around World War Two. They were Iowa Manufacturing, later to become Cedar Rapids, Incorporated and produced asphalt pavers and rock crushers. My father went to work at this company after returning home and retired there after 28 years in 1973. I had no idea that the large lot of parts I was buying for Chicago, Sioux, Aro, Paslode, eagle premier industries, florida, Top Cat, Ingersoll Rand, and Thor pneumatic products were so far back in time that I would have this much trouble getting schematics to sort all the parts into the correct model category. Try taking around 5,000 bags of different parts, some marked only with part numbers that are barely legible if at all, and some also with the model number included which has helped some and try to build a correct inventory. One drawer had over 500 rotor vanes and all loose. If anyone has any clue on locating any schematics from any of these brands, please let me know. Luckily, some of the tool parts I have are still being used in either the same model or a newer version but interchange information is also scarce. I’m sure there will be some interest in fixing that old girl that the guy just didn’t have the heart to throw in the junk pile. I’ll keep my fingers crossed and can post the lists of models I have. I believe I have the information for the Thor Bench Grinder. The Grinder in my father’s shop is a Thor still very functional though the bronze bushings could use replacement. I believe the info for the grinder is still in his file cabinet. If supplied, would you be willing to look through the parts for the bronze bushings and the two piece retaining rings for the 1/2″ arbor? I have a Thor bench grinder, model 127B. Appears to be a very late model with the Thor logo and nameplate (1970’s?). I’m needing replacement plastic guard windows, quench tray, motor brushes, and like everyone else, a copy of the owners manual. Any help? Is anyone interested in old Thor drills? I have three. I have a Thor 2798 still works . Just wondering what year or years that they were made ? Looks like late 50s early 60s. Thanks for any info. rebuild. does anybody know where i can purchase carbon brushes for this generator. Is there any links to finding the age, value and possibly a interested buyer of a Thor model 2A worm drive saw, has a 12 amp motor in its original blue case with orange lettering inside. Also has a original Can of oil inside. Was built in the Aurora Il factory. Still works very well. you are correct. it was on kane street in aurora illinois. my great grandfather worked there(i found his WWI draft card) he lived at 387 kane street, probably very close to this plant. I couldnt find the actual address of IPTCbu but I know his supervisor was F. Clausen.